It can be challenging for small companies to navigate the medical device regulatory pathways, especially when no one on the team has experience dealing with this type of work before. This was the case for SOLIUS, a phototherapy device company based in Seattle. It has worked with Greenlight Guru for two years now, and we recently caught up to chat about how it quickly got a compliant QMS in place, and ISO 13485 certification. We met with Linda Cox, the Senior VP of QA/RA and Clinical Initiatives, as well as James Wu, the Quality Engineer, to get the low-down on how they’ve achieved great results. SOLIUS was founded by a duo about seven years ago, but they have ramped up over the last three years or so. They received funding in that time and boosted product development. The team now has 12 people working on it. The product is a Class II phototherapy device that stimulates the body to produce Vitamin D. It’s a bridge between a medical device and a wellness device as it is stimulating the body to do something that it’s already meant to do. After working with Greenlight Guru, they are now ISO 13485:2016 certified and are also working on clearance through Health Canada, then FDA. It has been an exciting period of growth for them as they head into new markets. The device is the first of its kind in terms of labeling and conditions for use, which makes it unique, but also presents some challenges. The company's goal is to get to market with its current labeling, so it is waiting to see how things go with Health Canada, as well as meeting with the FDA to assess how the device is received. The vision was to bring the product to market as a medical device, which means the team knew early on that it needed to meet quality management regulations. As a small team, managing compliance and a QMS was an immediate challenge. At the time, there were four people on the team so it can appear as a daunting, behemoth task. SOLIUS was impressed with the talent and experience onboard at Greenlight Guru. The core team gave them the confidence that they knew what they were doing, and could help with both the software and the knowledge. No one on the SOLIUS team had expertise in medical device quality management at the time. The decision came down to seeing that the company had stability, talent was impressive, and the product was a viable long term solution. The early demos proved how helpful the software would be. Linda assessed the cost and decided that everything that came along with it including on-boarding, the knowledge base and QMS templates made the cost well worth it. The Customer Success Team played a paramount part in their success through guidance and mentorship in the early days. SOLIUS’ CTO worked with Greenlight Guru to get the software up and running, and found the team excellent to help them get systems in place. It took a few months to get all their data into the system as they were hesitant at first that they could make mistakes. Once they got the data in place, they realized that there really was no way for them to screw it up! Go through audit comfortably and confidently (no one had been through an audit before). Gain ISO 13485:2016 certification as it is paramount to get them into the Health Canada marketplace. The SOLIUS team found that having a software platform like Greenlight Guru markedly made a difference when it came to their readiness for audits, as well as the confidence of the auditor in their practices. They could walk the auditor through all parts of their processes up on screen, basically giving him a demo of the software. He could easily see they had everything he asked them for and that everything was clearly linked and traceable. Getting ready for the audit was effortless. All documents were easy to search, and Greenlight Guru helped by tracking history, approvals and changes. When James was asked about change history, he could easily pull a document that the system created automatically for that purpose. They could show how the design matrix related directly to design outputs and other documents, such as controls, rationale and risk. SOLIUS achieved ISO 13485:2016 certification with just two dedicated resources - James and Linda (as a half-time person - she also does clinical). Having worked with paper-based and other types of systems before, Linda says that gaining certification with any other approach would be next to impossible with only two resources. They usually require a number of people to get everything together, with a schema already set up. They made it through the audit in 3 days rather than 3.5, and Linda is confident that this wouldn’t have happened so quickly had they not had Greenlight Guru in place. They prepared by doing dry runs with Greenlight Guru up on the screen, rather than spending days printing documents. That alone cut down audit preparation, probably by at least a week Linda says. In other companies it has taken Linda three to four weeks to prepare, including setting up a staging room for the auditor, so this was a breeze by comparison. Linda’s comment was that it almost seemed too easy - she did go into the audit wondering if they’d missed anything due to the ease with which they’d got there. However, the auditor was palpably impressed and nothing was missing. They got their ISO 13485:2016 certification and were able to file with Health Canada within a matter of weeks. In James’ previous experience, there have been paper-based design history files and risk management files, along with matrices in Excel which quickly become a nightmare to manage. Greenlight Guru made it very simple to easily find and link these complex matrices. If something was referenced, then it could be found. He has worked on files with over 100 rows in the design matrix before, which took over a month to review and check for supporting documents. Their current matrix of 240 rows took a matter of days to review. Linda says also that if they didn’t have Greenlight Guru, they would need a much larger team to help with quality and compliance. It takes more people to manage paper-based processes and to be ready for audit. James’ favorite feature is the traceability through documents, design matrix and risk matrix. In his previous experience, those are three different systems and they had to painstakingly move between all three, whereas with Greenlight Guru they are seamlessly linked. He would otherwise have to go from matrix, to document control, to finding the document. In Greenlight Guru he navigates to the design input and clicks on the design verification. The flow saves a lot of time and doesn’t break up his thought process. Linda also thinks of it in terms of budget constraints for hiring. She could only have 1 FTE (James), and couldn’t comprehend how she’d manage that without Greenlight Guru. James does everything related to Greenlight Guru, largely on his own, which wouldn’t be possible with a paper-based system. Getting signatures is easy, which has made a great change for Linda. In other places, she might have had to physically walk around trying to get people to sign, whereas with Greenlight Guru, stakeholders don’t even have to be onsite and they can sign quickly and easily. Linda and James felt like they achieved the impossible in a short amount of time. The ISO audit was James’ one year anniversary of joining the company. When he started, all they had was a set of SOPs, so he had to modify them to make applicable to their processes and the size of the company. He met with the Greenlight Guru Customer Success Team regularly to help understand more how to design their quality system for their company needs. Within a year, they had complete design and risk matrices and a complete QMS that allows them to put their focus squarely on quality. They also feel that the knowledge base of educational and prescriptive articles can’t be underestimated. The software is a great platform, but that doesn’t help if you don’t understand the regulations or how those fit within the software. This was where the knowledge base came in to help put everything into context. Linda feels that the Greenlight Guru team is invested in their success. She had never been in charge of quality and regulatory before, as she came from marketing, usability and clinical trials. It was helpful to have a medical device expert from the Greenlight Guru team assigned to them as a mentor, as they didn’t have people with a lot of medical device experience to draw on. For James, the customer support and continuous improvement really stuck out. Even though the weekly meetings might be over, all the articles, webinars and support links help greatly. He likes being able to request features and feels that the Customer Success Team always look for ways to improve, and are patient with ensuring they understand what he is looking for. Linda says the Greenlight Guru platform is impressive and that it can’t be underestimated how much it has allowed them to succeed. Underneath the platform is also the team. She felt they were not alone in the process and feel that the Greenlight Guru team always has their back. 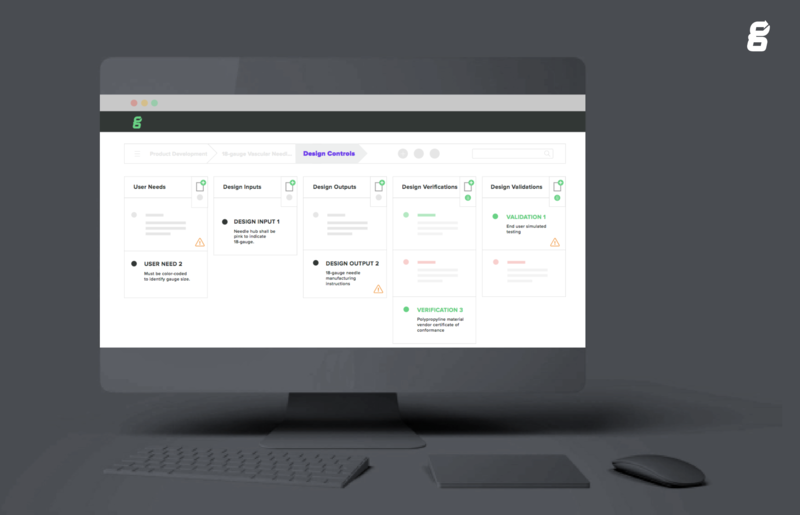 Find out how Greenlight Guru can have your back too, making compliance easy and allowing you to focus squarely on Quality by scheduling your personalized demo below.